What Is Financial Planning? 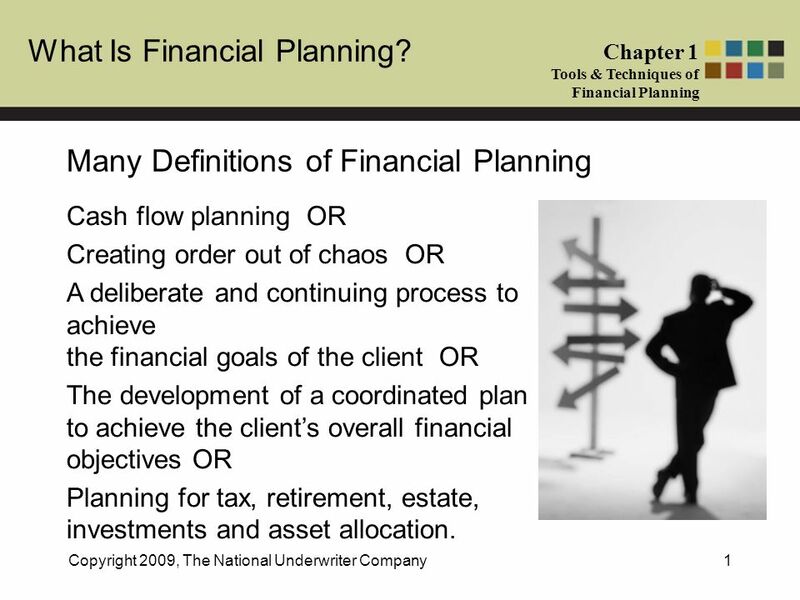 Chapter 1 Tools & Techniques of Financial Planning Copyright 2009, The National Underwriter Company1 Many Definitions of Financial. 1 What Is Financial Planning? Chapter 1 Tools & Techniques of Financial Planning Copyright 2009, The National Underwriter Company1 Many Definitions of Financial Planning Cash flow planning OR Creating order out of chaos OR A deliberate and continuing process to achieve the financial goals of the client OR The development of a coordinated plan to achieve the clients overall financial objectives OR Planning for tax, retirement, estate, investments and asset allocation. 2 What Is Financial Planning? 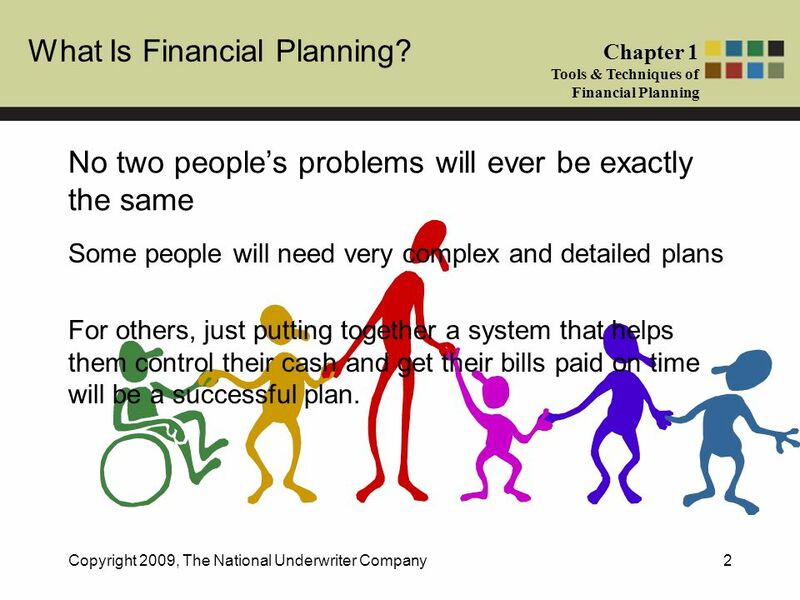 Chapter 1 Tools & Techniques of Financial Planning Copyright 2009, The National Underwriter Company2 No two peoples problems will ever be exactly the same Some people will need very complex and detailed plans For others, just putting together a system that helps them control their cash and get their bills paid on time will be a successful plan. 4 What Is Financial Planning? 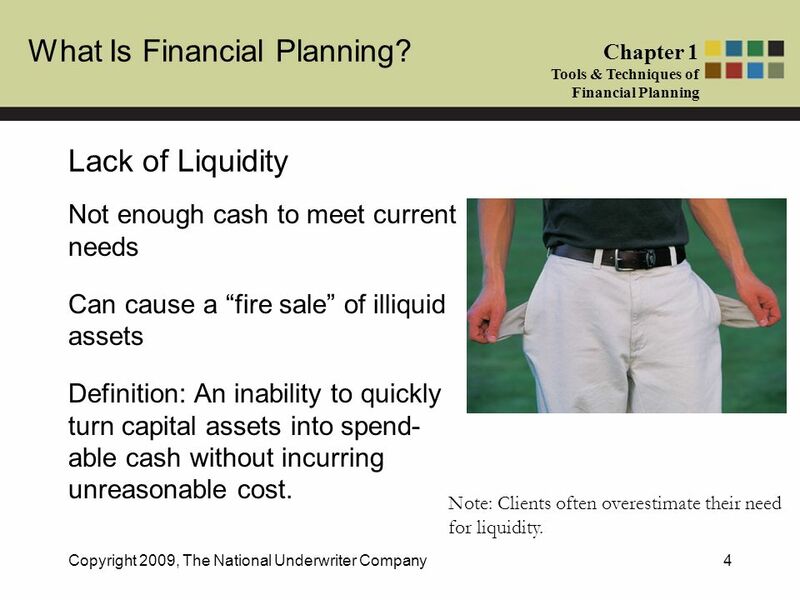 Chapter 1 Tools & Techniques of Financial Planning Copyright 2009, The National Underwriter Company4 Lack of Liquidity Not enough cash to meet current needs Can cause a fire sale of illiquid assets Definition: An inability to quickly turn capital assets into spend- able cash without incurring unreasonable cost. Note: Clients often overestimate their need for liquidity. 5 What Is Financial Planning? 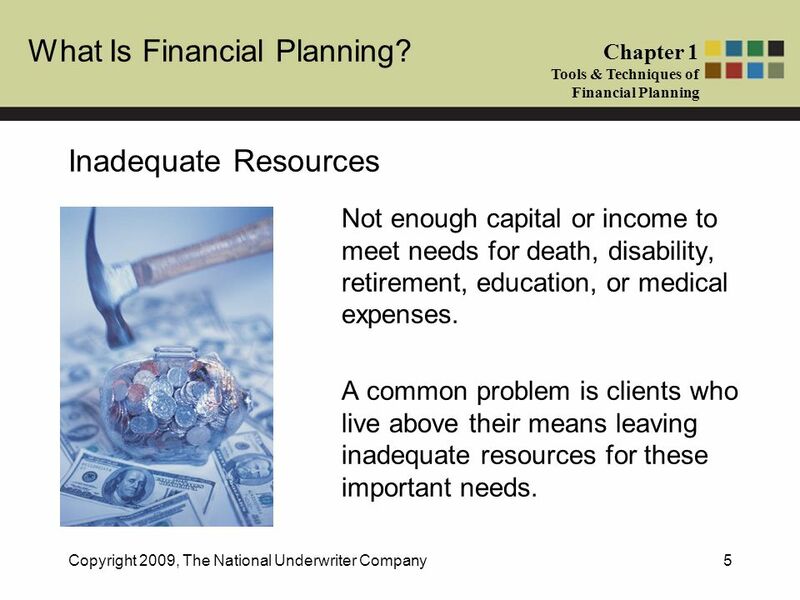 Chapter 1 Tools & Techniques of Financial Planning Copyright 2009, The National Underwriter Company5 Inadequate Resources Not enough capital or income to meet needs for death, disability, retirement, education, or medical expenses. A common problem is clients who live above their means leaving inadequate resources for these important needs. 6 What Is Financial Planning? 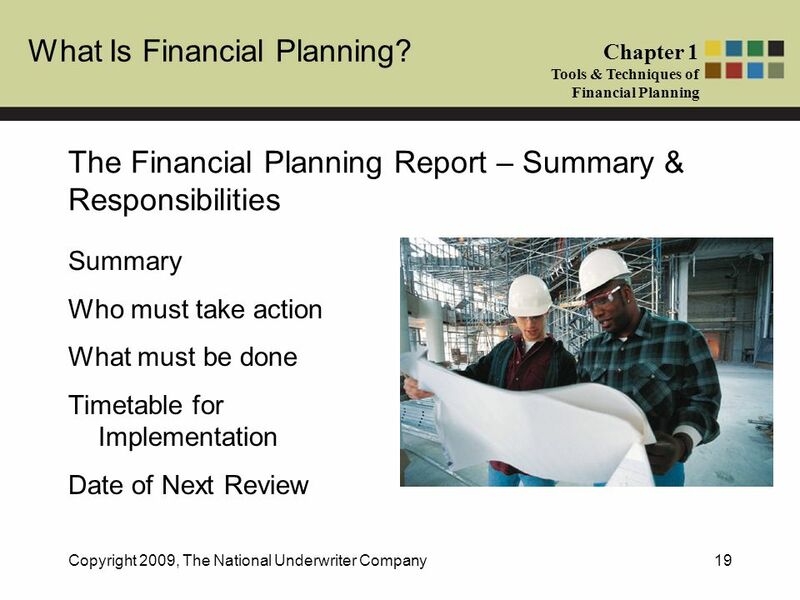 Chapter 1 Tools & Techniques of Financial Planning Copyright 2009, The National Underwriter Company6 Special Today! Only $50! Inflation The crippling impact of loss of purchasing power -- the ability of each dollar to buy goods or services. Note: For long term planning, this is one of the biggest problems, and is often unrecognized by clients. 7 What Is Financial Planning? 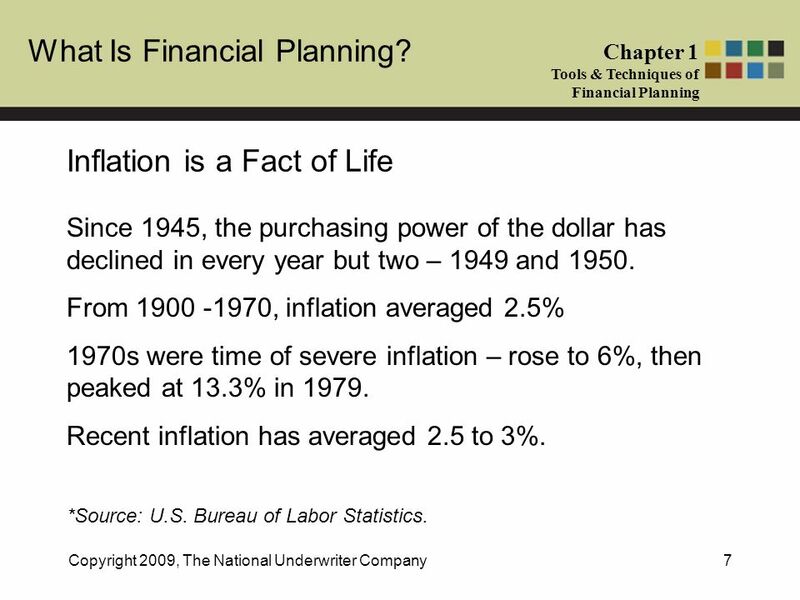 Chapter 1 Tools & Techniques of Financial Planning Copyright 2009, The National Underwriter Company7 Inflation is a Fact of Life Since 1945, the purchasing power of the dollar has declined in every year but two – 1949 and 1950. From 1900 -1970, inflation averaged 2.5% 1970s were time of severe inflation – rose to 6%, then peaked at 13.3% in 1979. Recent inflation has averaged 2.5 to 3%. *Source: U.S. Bureau of Labor Statistics. 8 What Is Financial Planning? 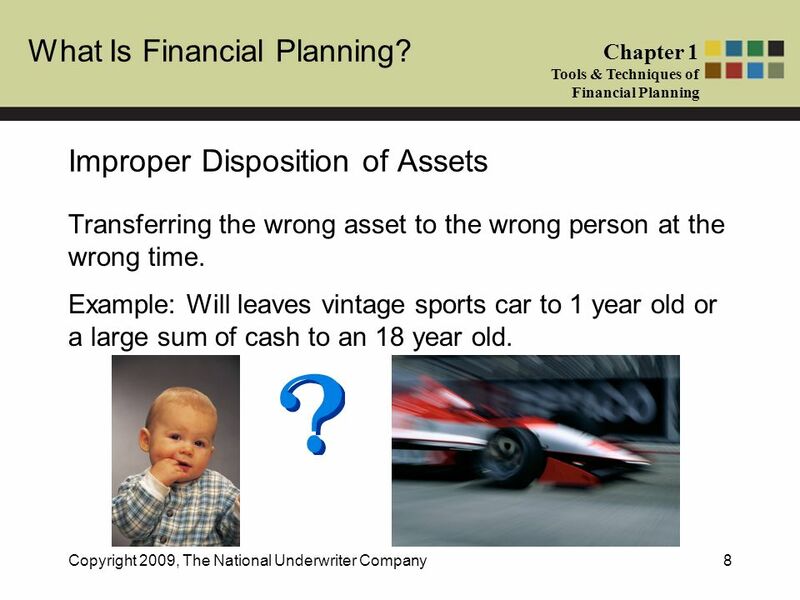 Chapter 1 Tools & Techniques of Financial Planning Copyright 2009, The National Underwriter Company8 Improper Disposition of Assets Transferring the wrong asset to the wrong person at the wrong time. Example: Will leaves vintage sports car to 1 year old or a large sum of cash to an 18 year old. 9 What Is Financial Planning? 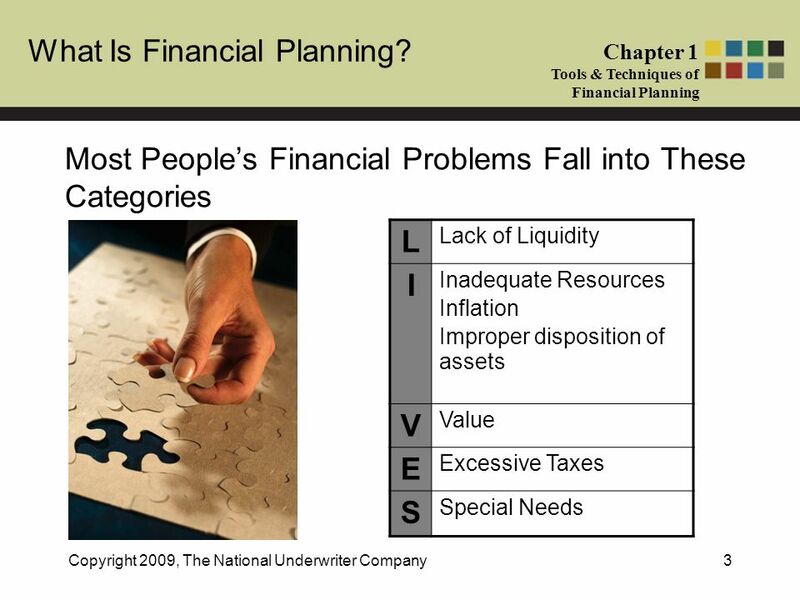 Chapter 1 Tools & Techniques of Financial Planning Copyright 2009, The National Underwriter Company9 Value The need to stabilize and secure the value of assets such as a business. Example: A business is dependent on the owners contacts and personal friendships to stay in business – a risk of value. I personally selected this just for you, Elizabeth…. 10 What Is Financial Planning? 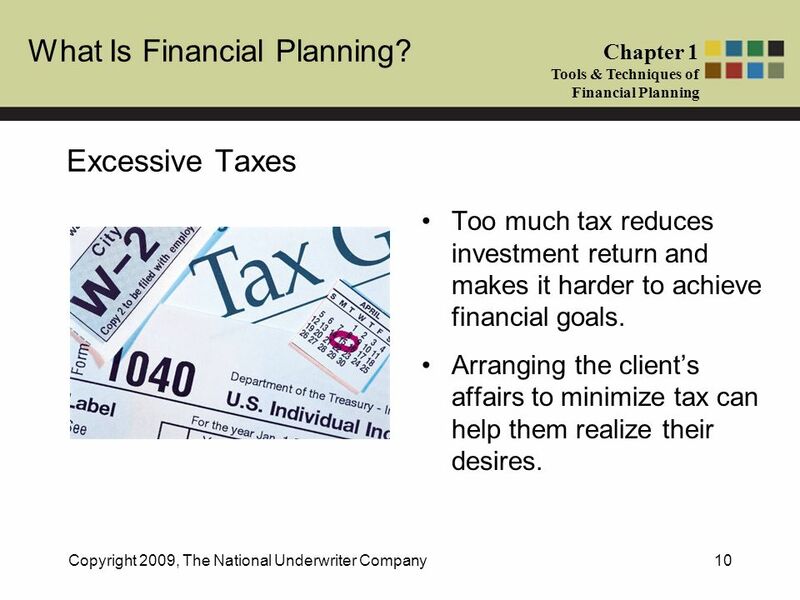 Chapter 1 Tools & Techniques of Financial Planning Copyright 2009, The National Underwriter Company10 Excessive Taxes Too much tax reduces investment return and makes it harder to achieve financial goals. Arranging the clients affairs to minimize tax can help them realize their desires. 11 What Is Financial Planning? 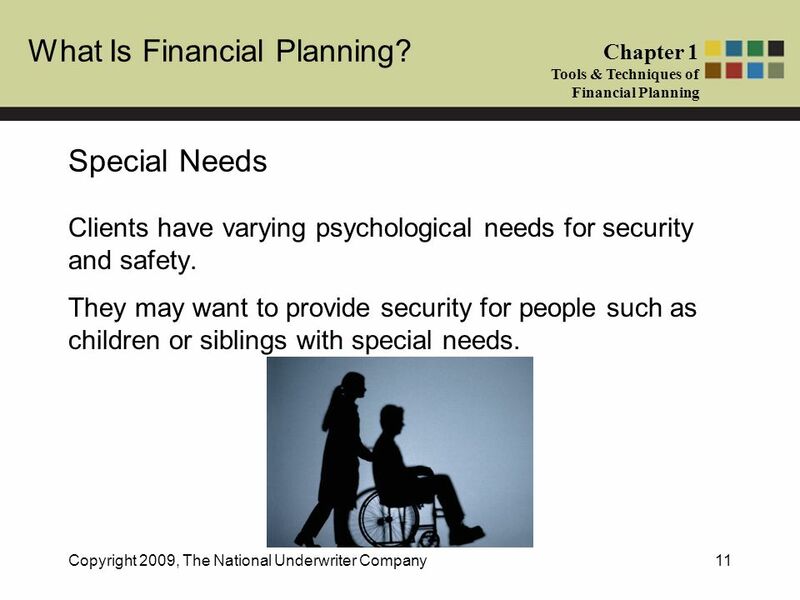 Chapter 1 Tools & Techniques of Financial Planning Copyright 2009, The National Underwriter Company11 Special Needs Clients have varying psychological needs for security and safety. They may want to provide security for people such as children or siblings with special needs. 12 What Is Financial Planning? 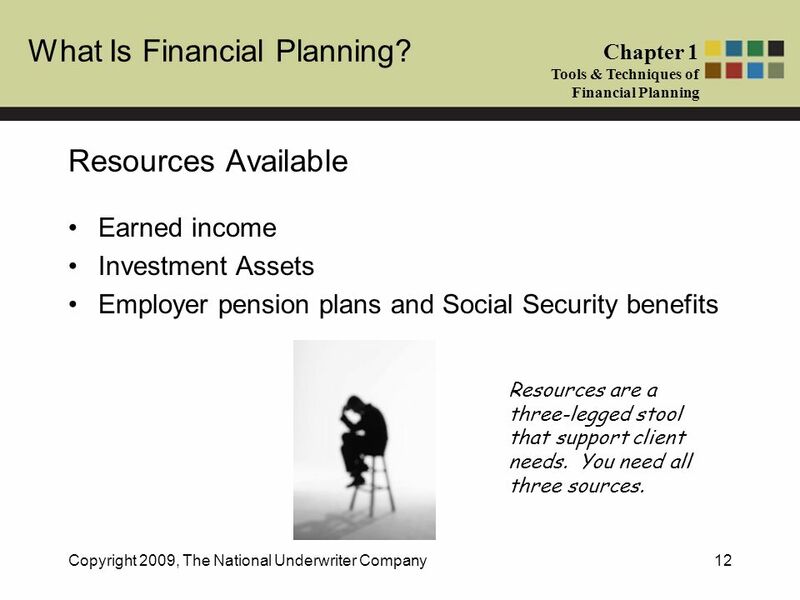 Chapter 1 Tools & Techniques of Financial Planning Copyright 2009, The National Underwriter Company12 Resources Available Earned income Investment Assets Employer pension plans and Social Security benefits Resources are a three-legged stool that support client needs. You need all three sources. 14 What Is Financial Planning? 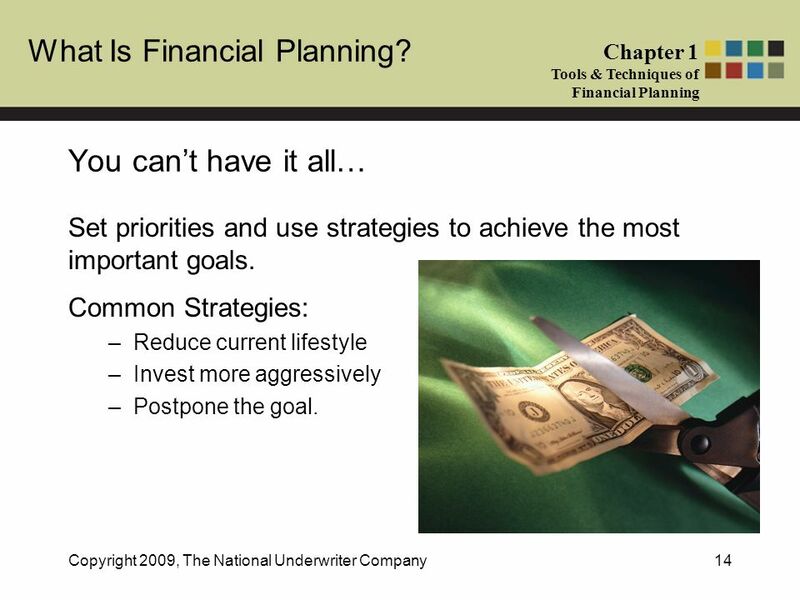 Chapter 1 Tools & Techniques of Financial Planning Copyright 2009, The National Underwriter Company14 You cant have it all… Set priorities and use strategies to achieve the most important goals. Common Strategies: –Reduce current lifestyle –Invest more aggressively –Postpone the goal. 15 What Is Financial Planning? 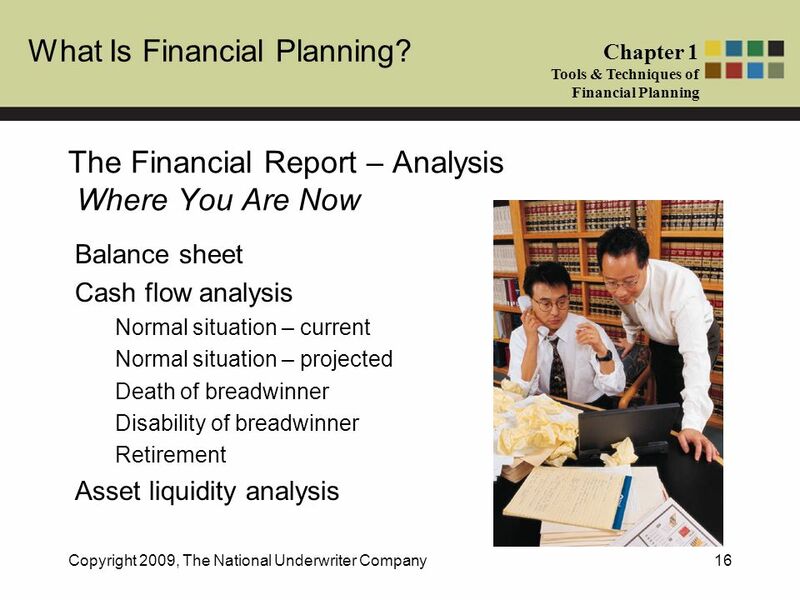 Chapter 1 Tools & Techniques of Financial Planning Copyright 2009, The National Underwriter Company15 The Financial Planning Report The report to the client should include: –ANALYSIS -- Where are you now? –OBJECTIVES -- Where do you want to be? –STRATEGIES -- How to get where you want to be. –SUMMARY – Summary and assignment of responsibilities Remember – Less is more. Be concise. Use pictures, charts and graphs. 17 What Is Financial Planning? 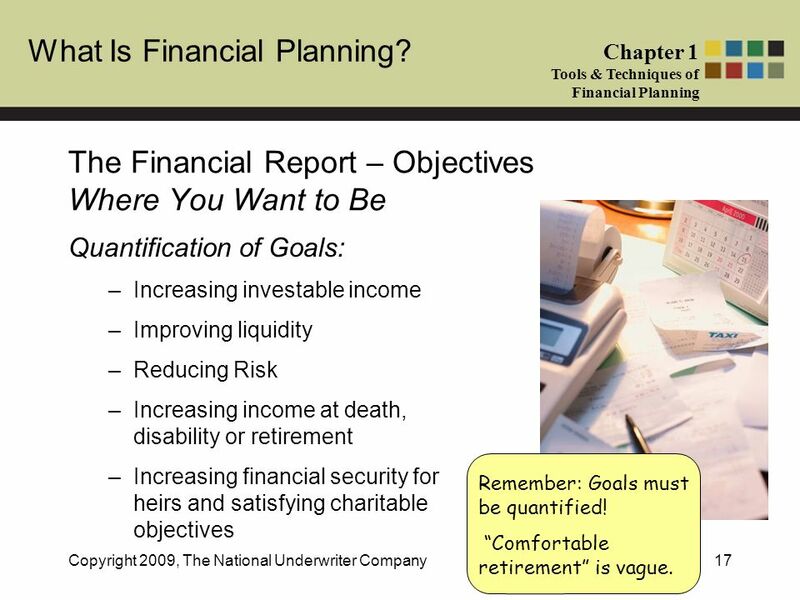 Chapter 1 Tools & Techniques of Financial Planning Copyright 2009, The National Underwriter Company17 The Financial Report – Objectives Where You Want to Be Quantification of Goals: –Increasing investable income –Improving liquidity –Reducing Risk –Increasing income at death, disability or retirement –Increasing financial security for heirs and satisfying charitable objectives Remember: Goals must be quantified! Comfortable retirement is vague. 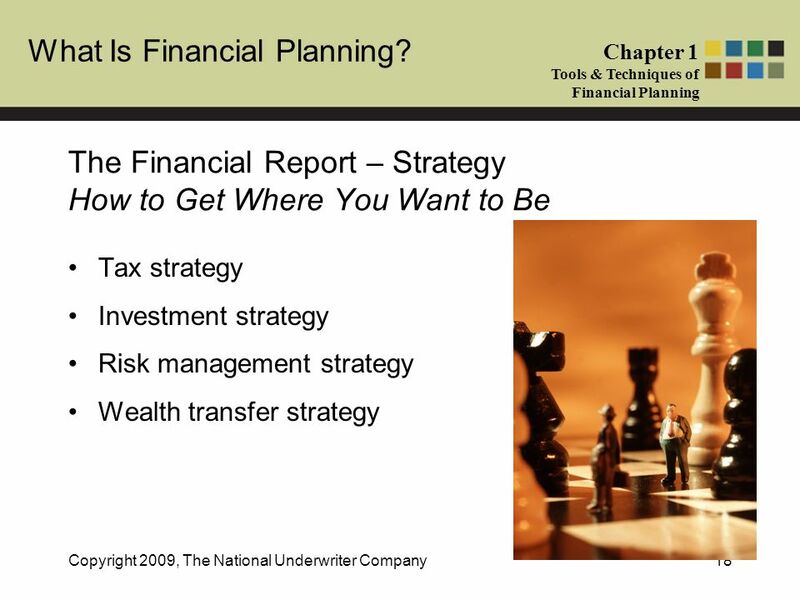 Download ppt "What Is Financial Planning? 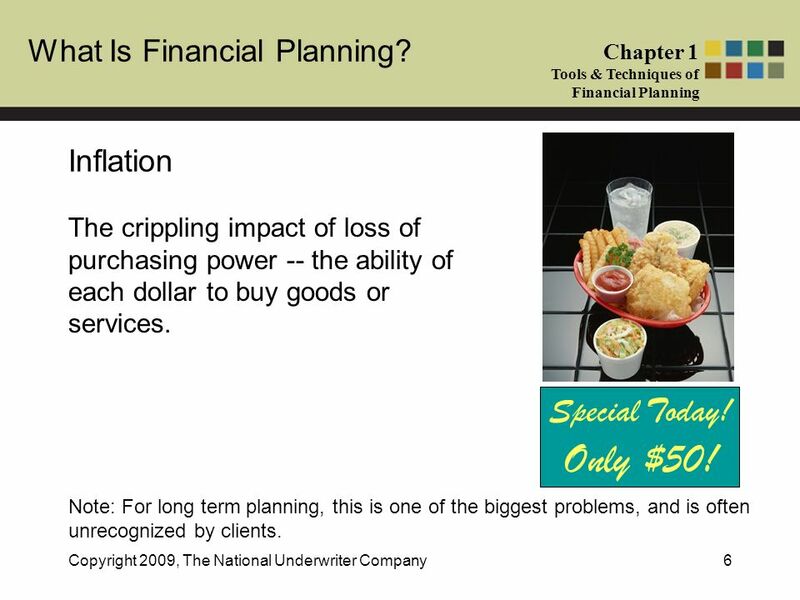 Chapter 1 Tools & Techniques of Financial Planning Copyright 2009, The National Underwriter Company1 Many Definitions of Financial." Who Is a Financial Planner? 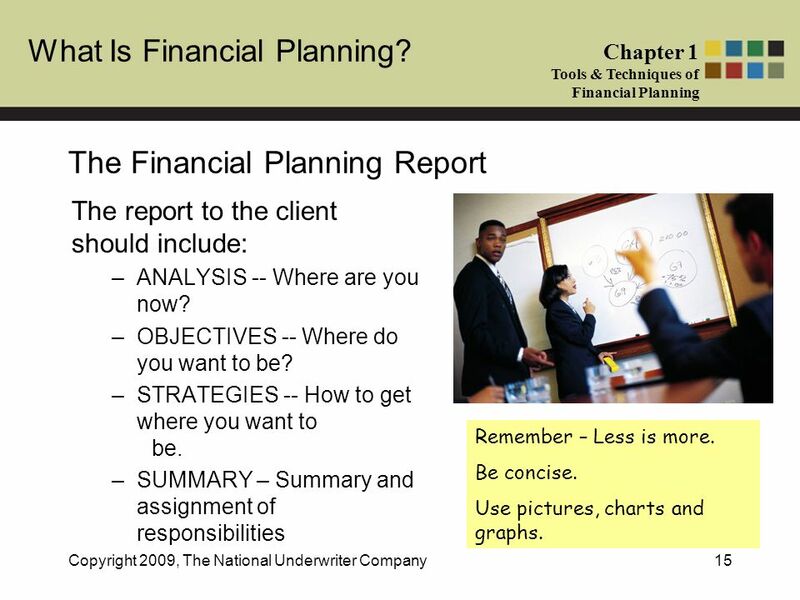 Chapter 2 Tools & Techniques of Financial Planning Copyright 2009, The National Underwriter Company1 Professional Financial. What is it? Real estate is land and the buildings and improvements on land. By definition, real estate includes natural assets, such as minerals, under. Company Car or Reimbursement Plan Chapter 53 Employee Benefit & Retirement Planning Copyright 2009, The National Underwriter Company1 What is it? Company. © The McGraw-Hill Companies, Inc., All Rights Reserved. Irwin/McGraw-Hill Chapter 3 Money Management Strategy: Financial Statements and Budgeting. 2-1. McGraw-Hill/Irwin Copyright © 2006 The McGraw-Hill Companies, Inc. All rights reserved. 2 Money Management Skills. Investment and Financial Services: What Every Financial Educator Should Know. 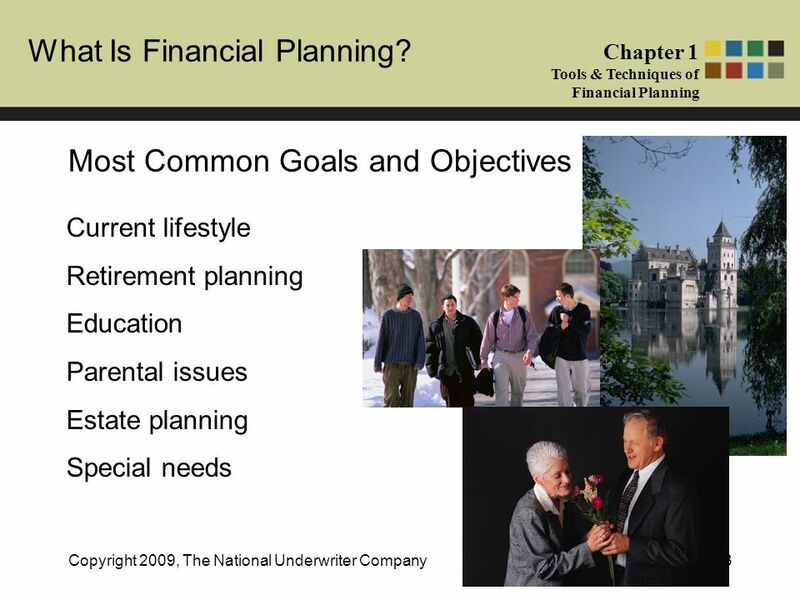 1 (of 22) FIN 200: Personal Finance Topic 2–Introduction to Financial Planning Larry Schrenk, Instructor. SMALL BUSINESS BANKING Meghan Kearns NATIONAL CITY BANK Small Business Finance Sources of Capital: Borrowing. 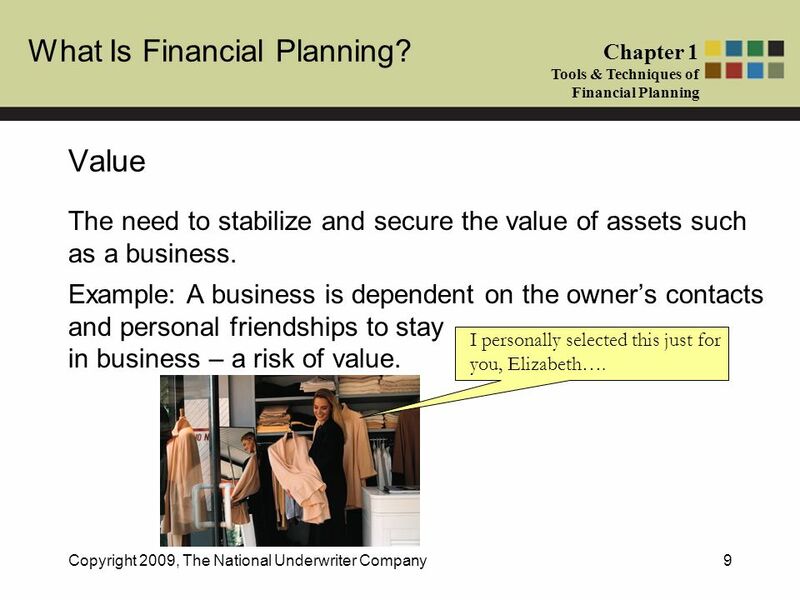 4.01 Understand financial planning..  Assets: what the company owns  Liabilities: what the company owes  Owner’s Equity: value of owner’s investment. Fundamentals of Life Insurance. The economic problem of premature death. Savings vs. Investing. Savings Investing is the purchase of assets with the goal of increasing future income. Savings is the portion of current income. Prentice-Hall, Inc.1 Chapter 1 Financial Planning: The Ties That Bind.